This week’s Tuesdays With Dorie recipe was rice pudding, which I’ve never liked. I’m not sure why, but rice pudding and bread pudding have just never been on my top-500 list, even though regular pudding (especially chocolate, and now, especially Dorie’s) is way up in the top five. But I’m a faithful TWDer (TWDite? TWDian? ), and so I made rice pudding. 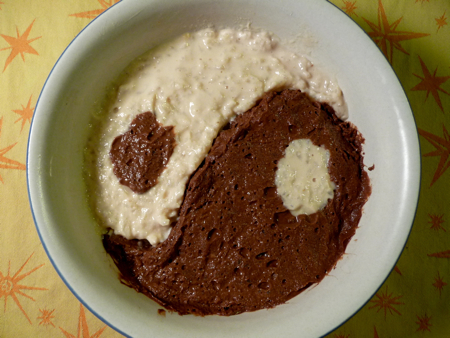 The recipe gives options for vanilla and chocolate rice pudding, so of course, I made both. The cooking was easy, although it did take about 45 minutes, rather than the 30 the recipe called for. And then I decided to get fancy. If you’ve read much of this blog, you know that presentation is not my forte. I read other TWD blogs, and those people make things look so pretty. Not me. But this time I was inspired — I guess the chocolate-vanilla combo was just too obvious to miss, even for me. Eating it, though, was less fun. I still don’t like rice pudding. I dislike these versions less than the goopy stuff I’ve had before; the flavor was very good in both. But there were all those little lumps of rice in there; what’s the point of that? Husband: It was a shame we had to ruin perfectly good chocolate pudding. #1 Son: Chocolate tasted good, but the texture was odd. 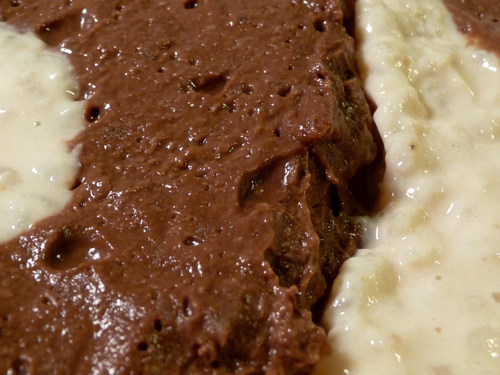 Why stick rice in a perfectly good chocolate pudding? But the vanilla was much more like traditional rice pudding, and I adored it. The flavor was really deep, and the texture worked better. I’m not sure why. #2 Son: I liked the chocolate better than the vanilla. The chocolate had a very nice, almost ice creamy texture. The vanilla was pretty good, but if you make it again I’d prefer chocolate. #2 Son is out of luck. I can’t see making this again, not when there’s a perfectly marvelous chocolate pudding in the very same chapter. If you want to check out the hundreds of other TWD bloggers’ versions, here’s the blogroll. And if you want to try the recipe yourself (even after my write-up! ), Isabelle of Les gourmandises d’Isa will have the recipe. Enjoy! This entry was posted Tuesday, November 18th, 2008 at 8:00 am	and is filed under Dorie. You can leave a response, or trackback from your own site. Stop it with that yin and yang! That is AMAZING! I love the ying/yang picture. Ohh your your pudding looks awesome! Black and white and yin and yang so cool! Love the yin yang symbol. Your pudding looks great! loving the yin yang symbol!! yours looks perfect. Oh, finally someone else who didn’t care for the bits of rice floating about a perfectly good pudding! LOL. We aren’t big fans of cold ricey things, so I hadn’t much hope, but I tried it anyway. Many of the bloggers just loved it, so I was a little fearful posting my entry this week as I usually have such positive things to say each week…ooops. Loved your post and your photos and food look great! You definitely win on presentation! Love it! !